This is the discussion related to the wiki page	"Baby's First Guide to Keter-Class Anomalies" & Other Questionable Documents Recovered from the Hard Drive of Dr. ████ ███████. (I'm copying this directly from my draft thread because why not.) This baby's book I wrote/drew for my close friend who was at the time expecting (not anymore!) is circulating on Tumblr, but I've wanted it on the mainsite since then, albeit with a little more context, and just now got around to it. Big thanks to WrongJohnSilver, DisquietRiot, DreamwalkerFae, Proxymoron, Decibelle(s), and sirpudding! Easy upvote for using a wholly unexpected and unique format. Well done. I actually just lost it when I saw that part. I'm really happy SCP-2521 is showing up more. I didnt identify it as morse. Good to know though. What does it say? Here's the original image from my Tumblr post/the original version of it. Hey, you posted it! Yay! …Was this researcher planning to read containment reports to his kid as bedtime stories? …..I guess he was hoping for his kids to grow up in his footsteps…. The SCP-2521 bit sealed my upvote. It's a bit similar to SCP-006-J, but the cute images and format are enough to differentiate the two for me. 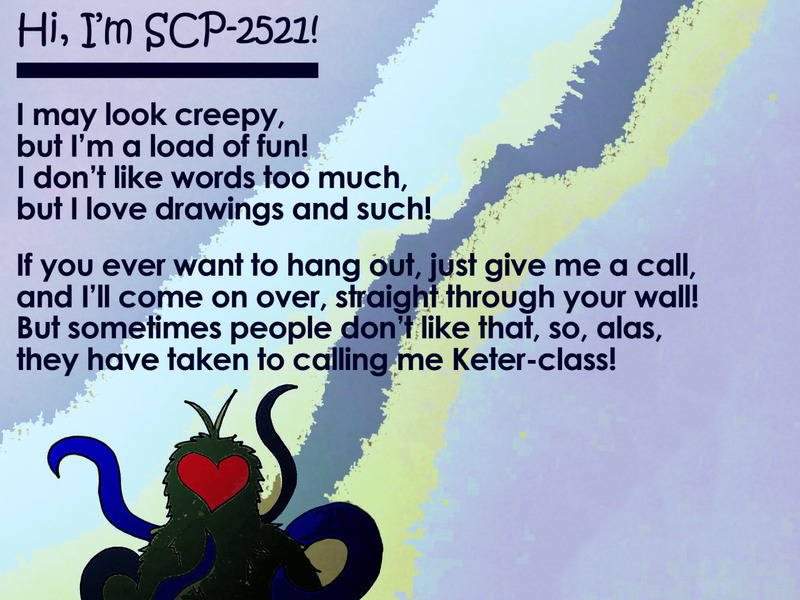 I suspect the Thekillerax meant SCP-009-J, which is also a an SCP themed children's book. Yeah, that's what I meant. Silly me. I was going to upvote just with 682 (that big lizard sure is full of sass) and then it just got better and better. And that last note was heartwarming enough to make the context belivable. Take your upboat you genius. Can anyone translate the morse? I'm on my phone and don't have an easy way to pull it from the image. As for the recipient, I have a really sinking feeling it's SCP-231. Oh lord, no. This isn't nearly that dark. Also, the skip he's assigned to has four blackboxes, so it's four digits. As for the morse, see my reply to LurkD up there. I was originally recommending SCP-2401. Although, if we don't really know how the physiology works, SCP-2662 would be a fun choice. Cripes, the pregnant ones seem to be the darkest articles. For one I kinda assumed it might be an SCP he had previous exposure to, maybe before the transfer, and for two I have it slightly headcanoned that they would add a 0 to the front of Series Is before blackboxing SCPs, because giving them a digit count is sloppy redaction, reducing the options by 1/3 or 2/3 (considering current series only). My new headcanon is what Petrograd said, combined with the implications of Fear Alone by djkaktus.